To Gift A Bride & Groom On Wedding Day . 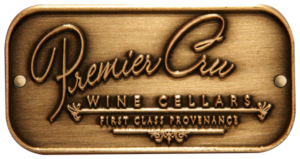 . .
Premier Cru Collections’ flagship offering is hand-blown (mouth-blown) lead-free stemware to help round-out your fine wine experience. Being lead-free means that it’s healthier & safer to use but, also, it means that it is much more durable than lead crystal. So much so, that just the other evening I accidentially knocked over a Premier Cru Collection Champagne Flute on our granite countertop – and, without being able to move, practically frozen in time, I couldn’t help but watch that Champagne Flute bowl – slowly in my mind – get closer and closer to the granite surface. And, when the champagne flute bowl reached its final destination – the granite countertop surface – Voila! that fine wine glass champagne flute was just that; fine! Although I knew that Premier Cru Collection stemware is exceptionally high quality, it’s an odd sensation when you’re experiencing it, firsthand, in a real-world setting; dropping the fine wine glass on a stone counter top, and nothing happening to it, really puts its value in perspective. This confirms our vision about Premier Cru Collection stemware, not only being of avant-garde, world-class, design, but being more durable than leaded crystal means that it is truly “Heirloom Quality” and that this is a line of fine wine stemware that one can truly handdown to there lovedones for many decades to come for them to enjoy and possibly hand down to your future grandchildren. Now, that’s old-world quality and world class value . . .
As an expression of our artistic vision, we have created Premier Cru Collection – “Essence of the Fine Wine Experience…” Only handmade, world class items are in the Collection. You can find Premier Cru Collection fine wine accessory Boutique at https://pcwinecellars.com/product-category/collection-stemware/ Our flagship offering is Premier Cru Collection hand-blown lead-free stemware is made in a 200 year old German glass factory, and is exclusively available through Premier Cru Collection in the whole United States. Being lead free means that it is safer and healthier to use and that it is much more durable than leaded stemware; so your Premier Cru Collection stemware will last a long, long time; That’s why we call it and all items offered in Premier Cru Collection “Heirloom Quality“.